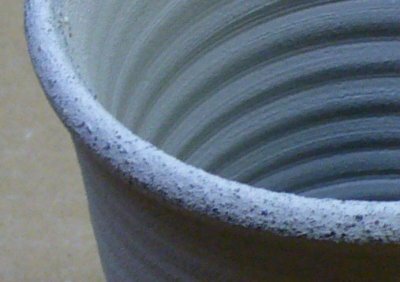 Black coring usually occurs during a reduction firing and is a result of fast firing and/or lack of oxygen in the kiln between 700 and 900C (usually in the bisque firing). If body carbon fails to oxidize to CO2 it steals oxygen from Fe2O3 (reducing it to FeO, a powerful flux.) This FeO will then flux the body, sealing it and preventing the escape of remaining carbon in the body. This produces the characteristic 'black core' you see on ware cross section. The more iron in a body, the greater the risk of this problem if firing is not right. Once iron is reduced to it is very difficult to reoxidize it back to Fe2O3. 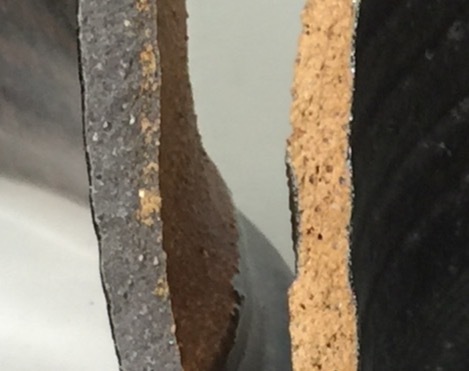 Notwithstanding this, there will always be some degree of blackness (or gray) in the cross section of reduction fired ware made from iron-bearing raw clays. This is a testament to compromises of reduction firing. As long as it does not exhibit glass development and melting it is likely OK. Note that electric kilns can also produce this problem, depending on the carbon and iron content of the clay, density of the pack, available airflow, and speed of the firing. A broken test bar of ball clay fired to cone 10 reduction. Notice the black carbon core. Ball clays commonly contain carbon, many have a noticeable grey color in the raw state because of this. Notice it has not burned out despite the fact that the clay itself is still fairly porous, the firing was slow and the temperature reached was high. Ball clay typically does not comprise more than 30% of a body recipe so its opportunity to burn away is sufficient. However some specialized bodies have a much higher percentage. These broken shards are from the vertical walls of similar cylindrical vessels. But they are not the same clay body. 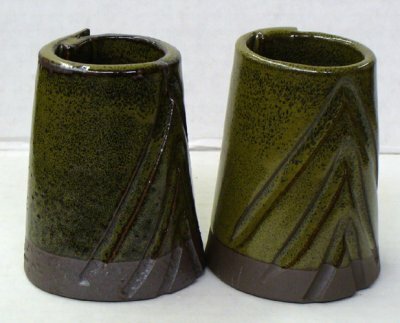 Both of the vessels were fired in the same cone 10R kiln. Both contain about the same amount iron. Both were glazed inside and out. But the body on the left is more vitreous and finer. The one on the right contains grog and is more porous. It is able to vent gases of decomposition better.